I have loved the range of books, games and activity sets from Laurence King ever since I started working with them on a review basis last year. They are passionate about quality, and every single item I have received from them has been incredibly durable, managing to stay looking good even with my heavy handed children around. 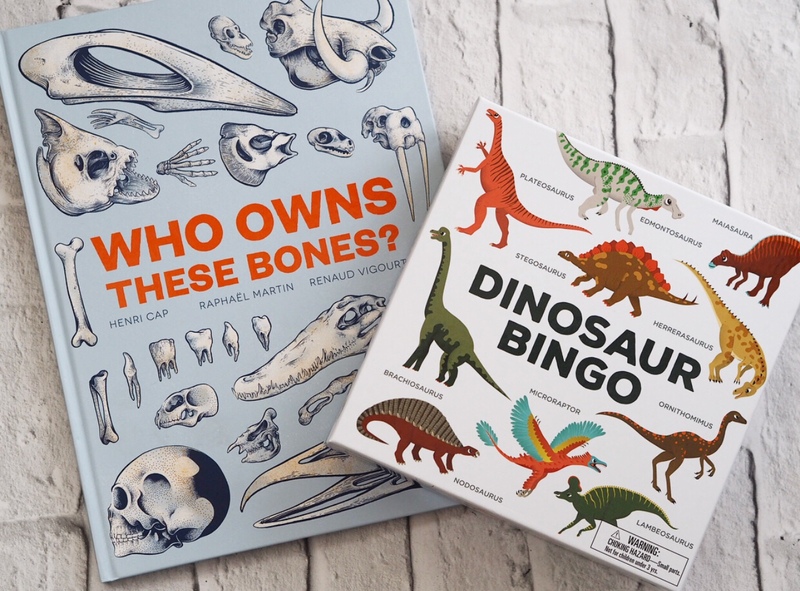 We were recently sent two new releases, the Who Owns these Bones book and Dinosaur Bingo game (both priced at £16.99 and available from the Laurence King website). Who Owns these Bones is a brilliant hardback book, complete with fantastic illustrations throughout, identifying the bones and really going into depth with knowledge, without being too complicated for older children. Cameron absolutely loved reading about different animal skeletons, and especially enjoyed the similarities in anatomy between humans and monkeys. I will admit I learnt a thing or two as well, especially when it came to identifying animals just from their skulls. Although jam packed with information, the book is laid out in a really child friendly manner, with lift the flaps and bitesize chunks of information keeping kids interested as they make their way through the book. This would make a perfect alternative gift for an older child. Having already been sent the Scary (monster) Bingo last Halloween, I knew that this one would be just as well received with my eldest two kids. Benjamin even got in on the action this time round, although he much preferred playing with the counters and shaking them in the box than actually playing properly! The set is really easy to put together, with the dinosaurs easy to pop out of their cards, and a little cardboard ‘dino head’ box, to put the cards in to draw, assembled within a minute. The game itself is similar to traditional bingo, but less complicated for little ones to grasp. It’s a perfect party game with a difference, and something to amuse and entertain on rainier days indoors with the kids. Cameron enjoyed collecting the different dinosaurs on his board and telling us all he knew about them, having learnt about the topic at school, and Carly really enjoyed competing against the rest of the family to be the first to shout Bingo! This is definitely a fun game suitable for the whole family and would be a brilliant gift for children aged 3 and up! We were sent the items featured in this post for the purpose of this review, however all words and images are my own.